What is storm chasing, or tornado chasing? What happens during a storm chase? What could you expect to see during a storm chasing tour? Are you guaranteed to see tornadoes? You can also write questions and comments in the comment field at the bottom of the page. Some meteorologists started chasing storms in the name of science many decades ago but storm chasing as a hobby and tourism industry is still quite young. The first storm chasing companies started in the mid 90’s and today there are over 15 storm chasing tour companies offering organized tours for groups. The whole idea about storm chasing is to find violent storms and experience the beauty and power they possess. The goal is not to get into the storms really, but rather stay at a safe distance observing them. This is at least true for the organized and professional storm chasing tour operators this website is about. A storm chasing tour is led by an experienced and skilled tour guide that have many years experience of storm chasing. Many tour guides also have a university degree in meteorology. The tour guide uses weather data, models and weather forecasts to predict regions that are likely to produce severe storms. This is done every morning and will determine which region the group will target that day, for example “South central Kansas”. On most days, the storms will be start to develop in the afternoons so the morning, and early afternoon hours, are spent getting into that region. Once in position, the tour guide will start to observe radar images of towering cumulus clouds, which usually starts to occur early in the afternoon. The tour guide will choose the cloud that shows the best features (rapid growth, altitude etc) and you will start chasing that storm. Chasing might be a misleading term since the first part of a chase usually consists of quietly watching the storms develop. You are looking for something like this. 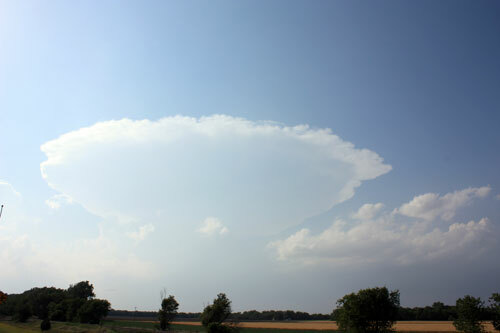 A single, towering cloud that have reached the upper wind levels and started creating an anvil. Hopefully, the storms continues to grow into a supercell thunderstorm. A super cell thunderstorm is the type of rotating storm that can produce large hail, strong winds and tornadoes. A storm is typically chased until it either dies off, the sun goes down or you find a better performing storm within reach. If the storm is too fast, one may have to let it pass and aim for another storm. Once the tour guide has picked a storm to chase it is important to be well positioned for the storm. Positioning is a difficult art of predicting the storm movement, mapping this against the road network and terrain while picking good spots to watch the storm. The tour guide will try to stay at an optimal distance from the storm in order to avoid hail, lightning, rain and tornadoes but still be close enough to observe potential tornadoes and other features. So, chasing a storm does not mean that you try to to be inside the storm, but quite the opposite! Depending on the storm and what it is likely to do, the tour guide could choose to stay close to the storm in order to see tornadoes or stay a bit further away to watch the structure of the storm (which could be breath taking). One thing does not necessarily rule out the other though. If the storm is likely to produce tornadoes, the option is almost always to go for the chance of seeing tornadoes. Although tornadoes are often the Number One target, sometimes an amazing storm structure (above) could be far more amazing than a small tornado at a distance (below). Once you start chasing the storm you will drive to stay ahead of it and make stops in order to get good views and photograph it. The speed of the storm determines how often, and how long, these stops will be. Really fast moving storms may cause you to observe the storm from the vehicle for most of the time, so make sure you have a window seat and that you go to the bathroom when you have time! What could you expect to see during your storm chasing tour? 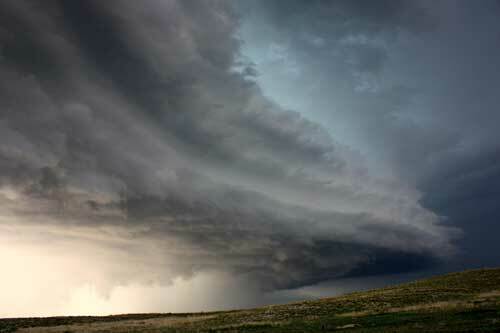 During a storm chase you may experience a wide range of amazing and peculiar weather phenomena. You could see tornadoes, super cells, intense lightning, wall clouds, mammatus clouds, lenticular clouds, huge hail, very strong winds and much more. You will also experience intense rain, beautiful rainbows and some amazing sunsets. Tornadoes are not only powerful and dangerous, they are often spectacular in their beauty. Here a tornado in its final rope-out stage. La Grange, Wyoming, 2009. Outside of being an adventurous nature experience, a storm chasing tour is also a road trip in the Friendly Midwest. Midwestern USA is a very flat and rural area with many crop fields, cute small towns and lots of friendly people. Don’t be surprised if the locals are curious about your storm chasing group but remember that not everyone is as excited about oncoming tornadoes as you may be! Storm chasing will bring you to areas that most tourist don’t see at all and you may find that a night in a local restaurant in Beatrice, Nebraska, could be a very exotic experience, especially for a non-US citizen! Are there any guarantees to see tornadoes? Tornadoes are usually the Number One weather phenomena that people desire to see during a storm chasing tour. For that reason, a common question is: “How likely is it to see a tornado during a storm chasing tour?”. This question is of course difficult to answer since weather is so unpredictable. One answer, however, could be fairly absolute – there are no guarantees to see tornadoes on a storm chasing tour, only likelihoods! If you are lucky you could see five tornadoes in one day during a Tornado Outbreak but you could also go on a 10-day tour without seeing a single one. A storm chasing tour company can only get you in good position for the best performing storm but if the weather patterns do not create any storms, there is really nothing to do but wait. Sometimes, even during tornado season there could go days without any storms at all in the tornado alley. This is more likely to happen early, or late, in the season than during peak season. Some tour operators compensate for this by having longer tours during early, and late season. 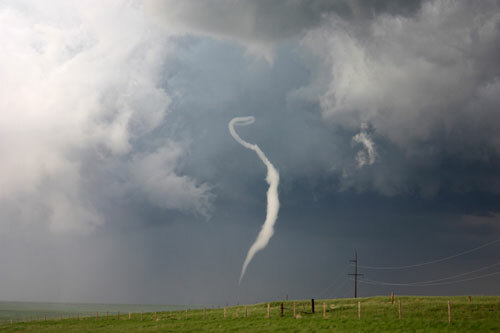 Having mentioned that, on any given 5-10 day tour during peak season you are, however, probably more likely to see a tornado on your tour, than to not see one. The likelihood of seeing tornadoes in a tour is well debated though. Chase day – A chase is a day when the forecasts and weather data shows signatures on possible severe storms. Your goal of the day is to find the best storm possible, and hopefully see a tornado. The goal for a tour is for every day to be a chase day. Bust day – Sometimes it seems likely that an area will produce supercells and tornadoes in the early weather prognoses but when you arrive to the area of interest, you wait…and wait…Some days, the skies are missing an important component and all clouds just fall apart. Those chase days gone buse are referred to as bust days. You obviously do not want too many of these! Down day – If there are absolutely no storms to chase, or the storms that are forecasted are in a distance that is impossible to reach, you may have to face a down day. During down days the tour guide usually takes you to an area of interest instead, such as a national park or a museum, while waiting for better options the next day. Travel day – Due to the changing weather and the movement of the air masses, one can follow a front for a few days. However, some days you need to completely reposition yourselves in order to get to a more promising location. These days are referred to as travel days. During a travel day, as well as chase days, you may travel through several states and spend many long hours in the vehicle. On a down day, your tour operator may take you to see some local points of interests. 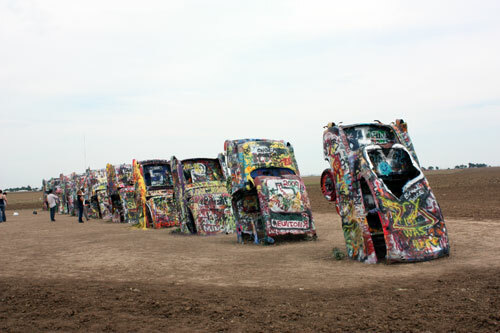 This is the Cadillac Ranch. Different tour operators offers different packages but most tour operators tend to eat at road side restaurants such as Denny’s, Applebee’s and some local good restaurants. If you are on a tight schedule (which is quite common) you may eat at fast food restaurants. Sometimes you may chase late into the evening and travel far afterwards and have very few, if any, options! Meals at different hours, missed meals, few restaurant options, few healthy options, snacks from gas stations are all things that you are likely to face. If you need to keep a strict diet, make sure you discuss this with your tour operator to see if you will be able to do so during your tour. When there is time, many tour operators try to fit in dinners with great local food as well. There are, for example, few things that will match a great Texan steak! 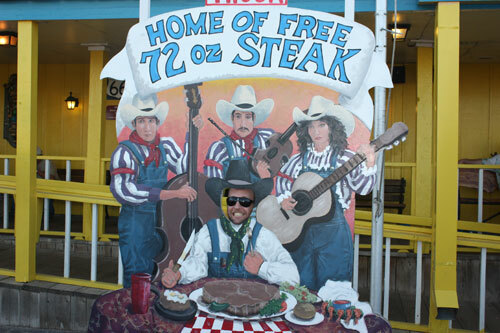 A popular spot to stop at is the Great Texan restaurant outside Amarillo, TX. For lodging, most tour operators choose low-budget alternatives such as Super 8 motels, Days Inn etc. Just like restaurants, there may not be too many options in the region you have been chasing in so the quality will vary. Keep your expectations accordingly. Most nights are spent in more or less remote areas and one is not likely to spend much time in large cities. If you need to do some shopping, many tours tend to stop at Wal-Mart once in a while. Is it safe to go storm chasing? 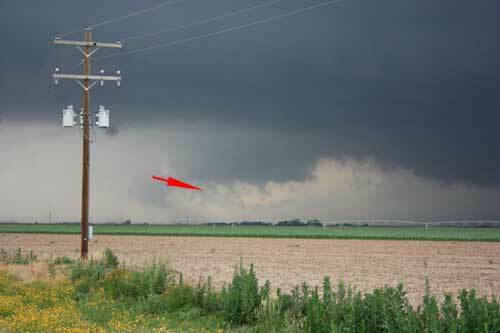 Read more about safety in the article is it safe to go storm chasing.